The film is Betty Anne Waters directed by Tony Goldwyn, with a screenplay written by Pamela Gray (Music of The Heart) and Richard LaGravenese (writer/director of recent Swank films P.S. I Love You and Freedom Writers, as well as The Fisher King, Bridges of Madison County). Betty Anne Waters was born in 1965. In 1980 a diner employee, Katharina Brow, was murdered in Ayer, Massachussets. One of Betty Anne Waters' eight siblings, younger brother, Kenneth Waters would be convicted of committing the crime in 1983. He was sentenced to life in prison. Kenneth was known for causing trouble in Ayers, Massachusetts and when Katharina Brow turned up dead in her trailer home, Kenneth Waters was a suspect, particularly when witnesses came forward claiming he confessed to stabbing her. Both witnesses were former girlfriends, one of these witnesses even include the mother of his child. Kenneth's younger sister Betty Anne didn't believe the conviction, and it was at this point that Betty Anne Waters began the passionate pursuit to free her brother from prison. Betty Anne a young single-mother of two young boys dropped out of high school, but went back to get her GED, then her bachelors degree, masters in education, and then a law degree from Roger Williams University. While earning her degrees, raising her family, and working part-time as a waitress she began to work with the Innocence Project in New York and in 1999 solicited the assistance of attorney Barry Scheck. Scheck helped Betty Anne Waters get blood samples of her brother and the murderer cross referenced and it was determined that Kenneth was not the murderer. He was exonerated in March 15, 2001. Betty Anne Waters continues her work in working to free wrongfully convicted criminals, as well as fighting for the rights of prison inmates. Betty Anne Waters stars Hilary Swank in the title role. Sam Rockwell plays the part of her brother, Kenneth Waters. Recent Oscar nominee Melissa Leo plays a cop who believes Kenneth is guilty of the crime, and Minnie Driver plays one Betty Anne's friends in law school. Juliette Lewis and Clea Duval also have roles in this film. Hilary Swank plays a variety of parts, and could easily get attention this year for her role in another bio-pic playing the part of Amelia Earhart. But one should never underestimate Hilary Swank, you never know how critics and audiences will react to her performances, and there's always a chance for this talented actress to get Oscar attention for playing any role. Will Swank get Oscar attention for playing this Real (Reel) Person? A week ago, Up would not be considered a strong contender for a best picture nomination - yet, now that there is 10 films that will be nominated for a best picture, at this point I would say Up in the only sure thing. Funny how things work. A week ago my predictions for Best Picture nominations would have been...Invictus (formerly The Human Factor), Nine, Amelia, Bright Star, and Shutter Island. Those five remains, but my new prediction for best picture now must contain 10 films...so here's my new list...and the addition to 10 means some "small potentials" like Up and Precious seem very likely. 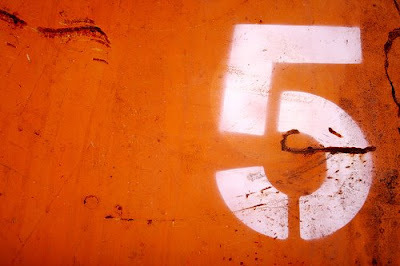 Have you heard the news this upcoming year there will be 10 best pictures nominees instead of the normal 5? Clearly it's a movie to see if the Oscars would have been a more popular award show if movies like The Dark Knight and Wall-E were given Oscar nominations last year for best picture. The argument is that it's connecting with the old days (1932-1943) when there were 10 best picture nominations. I'm not a big fan of "mixing things up" and in the past years have felt like there isn't always 10 films worth honoring, but it could be interesting. I think there is room for a few more nominations, but there could certainly be some films that get "Best Picture Nominations" this year that might never have been included. I can't help but contrast the startled reaction of Michael Jackson's death with that of Heath Ledger. When Heath Ledger died there was a sorrow and surprise, that was only tainted by the thoughts of suicide, and actions taken out of person self-loathing. Yet, it was in the spirit of this sorrow, and respect that Heath Ledger's death intrigued America as they wanted to remember the life of this 29 year old actor. 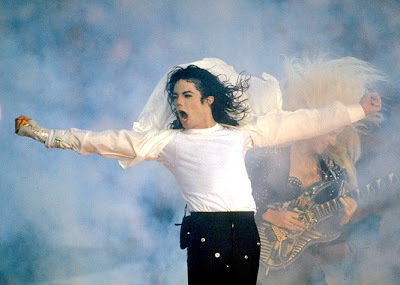 Michael Jackson's death today, at the age of 50 was met with a different response. The life of "the king of Pop" is filled with so many unique side-stories, like his lack of childhood with the Jackson 5, his rise to fame, his family, Diana Ross, and enough random tidbits to fill up biographies, television specials, tabloids, and art collections. So when I was at work and news came out, there was instantly mixed feelings of "who cares," saddness, and intrigue, and even happiness with a air of "Jackson deserved to die." I imagine the next days will be filled with tributes, bitter griping of the attention given to Jackson, and many magazine covers, news specials, and video clips. With that, I present the first 5 thoughts that come into my mind when I think of Michael Jackson...perhaps you will share your first thoughts as well. What are your first thoughts when you think of Michael Jackson? The in-laws apologetic after Madea Goes to Jail encourages us to watch Tyler Perry's Diary of a Mad Black Woman. Suggesting that they enjoyed this Madea much more, and they had previously not seen Madea Goes to Jail. Diary of a Mad Black Woman is interesting, Kimberly Elise's character, Helen, is actually the mad black woman in this film, not Tyler Perry's Madea. 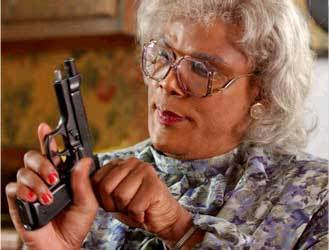 In fact, Madea, while having an important role in the film and bringing a unique comedic twist is not nearly as central in this film as she was in Madea Goes to Jail. Again, this film deals with serious issues, especially in African American culture, while mixing in some humor through the Madea character (as well as Madea's brother Joe). To be honest, as "the most popular Madea" movie, I think I actually enjoyed Madea Goes to Jail more. I say this with caution and aprehension. The fact of the matter is Madea is what makes these films enjoyable - the stories and acting leave something to be desired, and since Madea Goes to Jail has more Madea it was slightly more enjoyable to me. 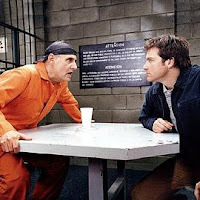 Arrested Development is a hillarious television comedy, and really is must see television. If you haven't watched the three season series, do so immediatly. Arrested Development is a comedy about family, and while it touches on many relationships, like mother-son, mother-daughter, grandfather-grandson, brother-brother, and cousin-cousin. But off all the family relationships the one front and center is father-son. The father-son relationship is featured prominently in this comedy, as it is in many television sitcoms. Comedy is usually most successful when it touches on something real and relatable. It's unfortunate in someways that the father-child relationship is such a ballpark for comedy. When I go "father's day card shopping" there are so many cards that deal with "apology for not being a good son" or "I forgive you for being a bad dad," or "I wish we were closer," and so forth. 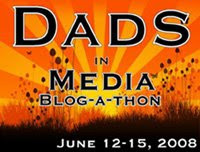 Father relationships in our current society are mediocre. And this can only be confirmed by comedy and how father-child comedy is so funny. I'm thankful for having a good dad, who while comical in his own way, is very supportive and loving and far more of a Michael Bluth that a Goerge Sr, Tobias, or Gob. But while my dad is the dependable Michael Bluth type of dad. I know people have George Sr dad's who manipulate their kids and use them for their own means, or Gob dad's who avoid there kids and are univovled, or even Tobias Fünke dad's who are so out of touch and self-involved that they can't begin to know their child. I hope Father's day is a good day for you, and a pleasant opportunity to enjoy your dad. I'm thankful for my first Father's day, and an opportunity to be a dad that is worthy of the title. So I watched my first Tyler Perry movie with the in-laws -- Madea Goes to Jail. I am not sure what to think of this movie. Tyler Perry is not Ron Howard, I know that. There definitely was laughter. There was occasional boredom - but I give it credit for carrying out what feels like a Saturday Night Live sketch for a feature length. I don't know if all Tyler Perry films are like Madea Goes to Jail in that it often times, deals with heavy material in a campy style, in the midst of uproar-worthy sketches, but despite what seems somewhat amateur, it is also somewhat appealing. Too often the drama and the comedy are separate. And I think somehow Tyler Perry's crazy off the wall characters somehow connect with something real in a unique and powerful way. If you've indulged/endured a Tyler Perry film or show what's your take? Has Tyler Perry created something meaningful with value, or just a goofy/amateur/cheap comedy? Happy Birthday RC, Love Your Wife! So this may get me in a bit 'o trouble...but I wanted to wish my wonderful husband, RC, a very happy birthday today! I could do this on my own blog, but I don't get nearly the traffic that you do, honey. For some reason sporadic posts about baby food, diapers and randomness from our family is not nearly as interesting as say, the Julie and Julia movie coming out this summer. So Happy Birthday R... C.........! I'm thankful for the brown house with red shutters that I share with the world's greatest husband! So my copy of Mastering The Art of French Cooking by Julia Child is due back to the library. (Side note: It's very strange to check out a cookbook from the library, it creates extra pressure not to get the pages dirty). I've enjoyed my three weeks of challenging cooking, and I've learned a lot, although I've focused more on the baking then on de-boning ducks and sucking out bone marrow. So, I've made Le Marquis with Glaçage au Chocolat, Supremes de Volialle a la Milanaise with Beurre Noisette and Choux Broccoli Etuves au Beurre, and Clafouti aux Myrtilles. If you click on the picture to the right you will notice some beautiful stiff peaks that were perfect for giving this chocolate almond cake the body that needed. It cooked up well, not flat and skinny like the last cake. This cake was unique too, because I don't think I've ever made a cake where I mixed nuts into the batter. Because of the whipped yolk and the way the recipe's put together the nuts, even though I could have made them smaller, were completly suspended in the batter and mixed in evenly. This cake, was kind of like a decadent brownie texture, with crushed almonds mixed through out. Yum. And because we made a chocolate frosting on the first cake, we made one of Julia's butter cream frostings...this recipe, the first of three is by far the easiest, the other two look almost harder to make then the cake. 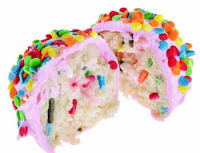 But the frosting, while good, is not like any butter cream I've ever had, because it is so buttery. In fact, it's mostly butter, and eggs yolks actually. My wife did an exquisite job frosting the cake and decorating, I think Julia would be pleased, and if she wasn't it's okay, because we were. The cake was delightful. Certainly one of the most time consuming cakes I've ever made before, yet delightful experience. My wife and I made "Julia Cooking" into a date, and the process was as fun as savoring the delicious rich flavor of this chocolate almond cake, Reine de Saba. So -- Shia LeBeouf is gearing up for Transformers 3 set for a 2012 release - but that's not the only sequel LeBeouf's talking about Indiana Jones 5 in this BBC interview for Transformers 2. 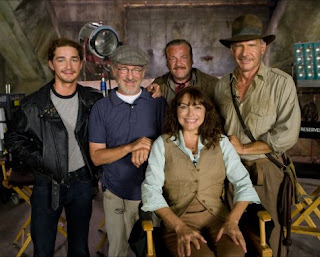 Indiana Jones 5 - wow, probably not music to everyone's ears, and it's hard to tell what secrets and mysteries Speilberg is planning on exploring, but I'm sure it's hard to argue at the opportunity to make Indy 5 knowing good or bad it's going to make money in the box office, as these films define the popcorn genre. Although I think one of the problems for the Indiana Jones franchise in continuing is deciding if they are going to stay true to the original films or if they are going to adapt in a way that captures new audiences. Very few film franchises have had fifth films, especially with theatrical releases. (You will notice most fifth films are horror). Earlier in the week, in "praising" M. Night Shyamalan for choosing non-original source material for his next project, I mentioned that I had thought a good project for him would the Booker Prize winning novel Life of Pi by Yann Martel. This book has been a very popular book, both critically and by general readers. To be honest, while I enjoy the book, it is hardly one of my favorites, in a way it is reminesce of other youth survival naratives like Gary Paulson's young-adult fiction novel Hatchet. Life of Pi is as much about the unique character of Piscine "Pi" Molitor Patel, particularly his broad pluralistic religious paradigm that allows him to worship God through the different aspects of Islam, Hindu and Christianity. In this regard, in order to get the full "impact" of the story, it cannot just be a novel about a young Indian boy from Pondicherry who through a unique series of events ends up lost in the Pacific Ocean on a boat with a Bengal tiger, a wounded zebra, and an orangutan. Telling this story, would mean that the majority of screen time would be filled with a single character and a tiger. With many people familiar with the source material, veering from the history, religion, and emotion of this story would be very challenging, not to mention the complexities of filming a story where an animal plays a central character, and it's not a monkey who dances around in a bikini with a cigar. Apparently, I wasn't the only one who thought Shyamalan could pull of this film, and at one point it was a possibility, but in 2005 M. Night Shyamalan was replaced by Alfonso Cuaron (Children of Men, Harry Potter and the Prisoner of Azkaban, Y Tu Mama Tambien) to direct. Yet obviously, that didn't happen...and earlier this year Variety has reported that Ang Lee will be directing a film adaptation of Life of Pi. Frankly, if I could chose a director for this project I think I would chose Richard Linklater, and this film would be handled similarly to Waking Life with different animators being able to take over different portions of this film. I think a more mature animation style would open the film up to truly explore the true nature of the text, and that animation would allow the writers ultimate freedom in telling the story. Although, I hardly think that's going to happen. All the same, I think if Ang Lee or anyone else is capable of successfully pulling off a film adaptation of this story that their is true art and mastery in their work, because frankly I think there are far to many challenges to capture this story in a way that is engaging, captures the uniqueness of the source material, and is cinematicly cohesive. I mentioned in my post on my French meal, Supremes de Volialle a la Milanaise with Beurre Noisette and Choux Broccoli Etuves au Beurre, that I had also made a dessert to go with this meal. I will keep you waiting no longer, it is a desert that Julia Child considers "a simple" dessert, but apparently Julia never bought a pint of Ben and Jerry's or made a box of Betty Crocker brownies. This dessert is the Clafoutis which the cookbook calls a "Fruit Flan." All this is not why I would consider a flan but whatever, can't argue with Julia can I. The recipe was wonderful because unlike all the other desert recipes I didn't have to split the eggs, in fact, I got to make the batter in a blender, and it was pretty easy, mostly milk and eggs, and a little bit of flour. Julia gives us a number of variation f or this recipie, cherry, cherry with liquer, pear, plum, apple, blackberry, and so forth. I chose to make it with blueberries...they're in season, they're yummy, and they worked great with this recipe. First you do a light layer of the batter and cook it just a bit to create a crust, then add the berries a some sugar, and pour the rest of the batter over it and cook for an hour. This is nice too because when it's done you don't have to "decorate it" or do any thing else -- it's done and ready to serve. The desert is impressive because even though you only have one batter you end up having three different layers and textures, the bottom layer, and inner "filling" and then a light and crisp crust. It's absolutely magical. Then per Julia's recommendation, I sprinkler a little powdered sugar on top, and per my own recommendation made some coffee and enjoyed. It even tasted good a couple days later. I have to say, I think I could easily become a clafouti fan. I will definitely make this again, and can only imagine how it might taste with different fruit. Thank you Julia. The New M. Night Shyamalan: Can The Last Airbender Save Him? M. Night Shymalan is a director who has branded himself so well that most people recognize his name. I think I've seen every M. Night Shymalan film in the theater with the exception of The Happening. After it's opening weekend, the film audience for The Happening almost disappeared immediatly due to the fact that this is was of the least satisfying films Shymalan has ever made. And while films like Lady in the Water and The Happening have recently been generally perceived as big disappointments, the curiousity can't keep everyone at bay. While M. Night Shymalan plays with different types of paranormal themes, his films end up having a certain feel that is unique, but can also make his very unique films seem unoriginal. I have long felt like M. Night Shyamalan should stop writing his own original screenplays for awhile, despite his Oscar nomination for writing The Sixth Sense. It's hard to be deeply creative, stylisticly and in creating rich stories and characters, and as a result I think the quality of films branded with M. Night's name have been weakened. While I could think of a variety of potential stories I'd like to see M. Night Shyamalan adapt (like The Life of Pi by Yann Martel), I am proud, yes, that's right, proud of Shyamalan's attempt to veer away from the original modern paranormal fable and instead do something different. Next year, we will certainly all hear about the great success (or perhaps the failure) of The Last Airbender. Avatar: The Last Airbender is the popular award winning animated television show about a mystical Asian world with four kingdoms represented by Eart, Wind, Air, and Fire. In this story the Fire Nation is waging war against the other nations, and the last hope is Aang the last known survivor of the peaceful Airbenders. While a martial artsy mystical film with a full cast of characters doesn't quite line up with M.
Night Shyamalan's previous films, I commend him for working with a new type of genre and adapting from previous source material. I feel like not only does this film have great potential to draw from an audience that might have passed on previous films by this director. Similarly, I think that Shyamalan's style has the potential to spring some creativity in a martial arts action film, that could create some lasting stylistic elements (I think of what the Wachowski brothers did with the Matrix, and how they really brought some new looks and feel to film). 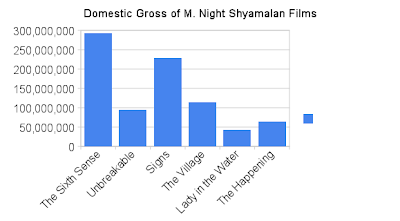 As a person who even found redeeming qualities of Lady in the Water, I consider myself a moderate Shyamalan fan, and am interested to see how The Last Airbender is received, and really hope it's great. Additionally, this films elemental nature will of course have a water element, which I am convinced is Shymalan's deepest fear/fascination. I have a feeling that the graph above will have a peak much higher than recent films, and that it will capture a whole new audience for the director and potentially lead the director down a new path, particularly if it is made into a trilogy with Shyamalan involved with each of the projects. For some reason, food is interesting to me. I think most people like food, but food in cinema is super interesting to me. Somehow wrapping a film around food, for example Pixar's Ratatoille or Lasse Hallström's film Chocolat. Next weekend, the documentary Food Inc. will have a limited release by Magnolia pictures. Food Inc. is the second film adapted from Eric Schlosser's book Fast Food Nation . The previous film with Richard Linklater's 2006 dramatic film title Fast Food Nation, that received a less that excited response. Food, Inc.'s concept to explore the corporate nature of food, and expose the deception, abuses, and dangers associated with our current food system. A film like this is compelling to me, but seems far from original, and certainly doesn't capture the excitement of a dramatic film that romanticizes food, all the same, done well this is a film I'm interested in. I think food is such a bid part of our life, getting us to stop and think about what we are eating and where it comes from is valuable. I ran across the first three minutes of the film and if anything, they did a really fun job with their production credits, and their original music written by Mark Adler sounds well--very Danny Elfman like. The film is Within the Whirlwind, directed by Marleen Gorris and written by Nancy Larson. Whether you spell her name Yevgenia, Eugenia, or Evgenia, all depends upon how you want to translate her name from Russian (Евгения Соломонова Гинзбург). Evgenia was born in Moscow in 1904. Her father was a Jewish pharmasist who relocated their family to Kazan (capital of Republic of Tatarstan, Russia, in the East-Central part of the country). Evgenia went to college in Kazan in 1920, where initially she studied social sciences before switching her studies towards being a teacher. Beginning her career became a teacher and married doctor Dmitriy Fedorov. Together they had a son, Alexei who was born in 1926. Evgenia remarried a few years after the birth of her son, to the mayor of Kazan, Pavel Aksyonov. She had a second son in her second marriage, Vasily Aksyonov, born in 1932. During this time, not only a teacher, Evgenia also became an active community member. Teaching at Kazan University she moved up through the ranks. By 1934 she was named head of a new department at Kazan University over the history of Leninism. On December 1, 1934, Bolshevik leader Sergei Mironovich Kirov was assassinated. This assassination set off what is commonly referred to as "The Great Purge." This great purge was in many ways the Soviet Holocaust which occurred in the late 1930's under Joseph Stalin. This change in the political climate in Russia had a great impact of Evgenia's life who was forced to quit the University just a year after receiving her prestigious position. The conflict continued as the Great Purge and Stalin's power increased. After a long fight, Evgenia lost her party card, and in February 1937 was arrested as she was accused of being a counter-revolutionary. After a six minute trial, she was sentenced to 10 years in prison. This was followed by the arrest of her family and seizure of her property. Evgenia was sent to many different camps across Russia, but the majority of her time was spent on the far Eastern edge of Russia in Magadan. In this port-town camp Evgenia, at a weak and unhealthy state was given the opportunity to be a nurse, at the recommendation of a German doctor at the camp, Anton Walter, who had been deported due to his German heritage. Anton Walter and Evgenia eventually married. In early 1949 Evgenia was released from the labor camp, but was required to stay in the city of Magadan. At this time she began to write her memoirs in secret, while she took on a role teaching kindergarten. Despite Evgenia's release in Februray 1949, she was rearrested, with no reason given, in October of the same year. She was relocated to a labor camp in north-eastern part of Russia in the Kolyma valley. Finally in 1955 she was released from prison, two years after Stalin's death. She was at this time allowed to return to Moscow. She worked as a reporter in Moscow while she worked on her memoir, Journey into the Whirlwind . She finished her memoir in 1967, and the manuscript was smuggled out of Russia where it has since been published. The film, about Evgenia Ginzberg focuses on the trials of Ginzberg, particularly her life after "The Great Purge" began, as opposed to early life and experiences with the communist party in 1920s and early 30s. The twice nominated Oscar nominee Emily Watson, will be playing the role of Evgenia, in what is supposed to be an award winning performance. Watson's supporting actors include a foreign cast, including the acclaimed German actor Ulrich Tukur, who will play the part of the German exiled doctor Anton Walter. Director Marlen Gorris has impressed the Academy of Motion pictures before with her writing and directing of the Oscar winning film Antonia's Line, and the power of Evgenia's life as portrayed by Emily Watson could make a splash on this years film scene. Could Emily Watson's portrayal of Evgenia Ginzberg earn an Oscar nomination/win for portraying this Real (Reel) Person? The other day you saw my attempt at the chocolaty semi-complicated cake Le Marquis. If you have been following this blog, you have seen that I have taken a chance to delve into the world of Julia Child, Julie Powell, and their books Child's biography My Life in France and Julie Powell's book Julie & Julia. Well here's what happens when I get my hands on the book Mastering The Art of French Cooking. Last night I attempted something more ambitious than Le Marquis - a chicken dish called Supremes de Volaille a la Milanaise. This dish is a Chicken Breast that is rolled in a flower mixture, then an egg mixture, then a Parmesan and bread mixture and then sauteed in a lot of butter. Not just any butter, but butter that has been "clarified." (Julia Powell's blog post when she made this recipe can be found here). I have never clarified butter before, but it worked out alright. In fact the whole recipe of the Supremes worked out pretty well. When these were done I continued to make the brown butter sauce (Buerre Noisette)...which was relatively simple, and gave me an excuse to chop up some fresh parsley. Julia Child is all about fast cooking, and I think she would be disappointed that this took me about an hour and twenty minutes to complete -- but if it's any constellation, I also made Blanched Broccoli braised in butter. I have never blanched or braised before -- but it worked out really good, and I feel like I successfully accomplished Julia Child's specifications of getting the vegetables impregnated with butter. It was a lot of fun. One thing I am enjoying is the new techniques I'm learning how to do. Child's cookbook while complicated and sometimes composed in a complicated way, also is at least written in a way I can learn new things, and make some fabulous (and rich -- yes I used 2 1/2 sticks of butter here) to make this meal.